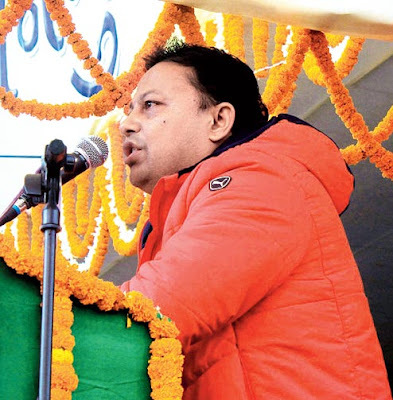 Darjeeling: Rebel Gorkha Janmukti Morcha leader Anit Thapa on Sunday indulged in plainspeak and candour by saying it was the Bengal government that had put him and Binay Tamang at the centre of politics in Darjeeling. Thapa, who is the vice-chairman of the board of administrators (BoA) appointed by the Mamata Banerjee government to run the GTA, asked people to stop hero-worshipping him and Tamang. "We must not indulge in politics of lies and false promise and speak the reality. It is the state government and not the public which has brought us here. But we will work hard to win people's mandate," Thapa told a public meeting at Darjeeling Motor Stand. Sources close to the dissident camp claimed that more than 4,000 people were present at the rally though Morcha president Bimal Gurung had given a call to party supporters to boycott the meeting. Although the Gurung camp has been critical of Thapa and Tamang and accused them of being Bengal government's "stooges", Thapa was unapologetic about it. "The GTA was accepted in 2011 and it was to be under the state government. Why should one make pretence of this body? We will work closely with the state government," he said. Tamang is the chairman of the GTA's BoA. After stressing the need for greater co-operation with the government, Thapa made it clear that the nature of hill politics must change. "Binay Tamang and Anit Thapa are both being slowly hero-worshipped. It must change immediately and the politics of hero-worship must end in the hills or else, our party will get back to the same old trend," he said. The comment is significant as leaders who led the Gorkhaland movement - be it Gurung or Subash Ghisingh of the GNLF - got the status of heroes in the hills. "Because of hero-worshipping, no one dared to ask them questions. If Anit and Binay want to change that culture, it's good," said a veteran Morcha leader. On Gorkhaland, Thapa urged the people to be pragmatic. "We raise the Gorkhaland issue whenever we start losing public support. Gorkhaland must be raised only after laying solid ground, working out a proper strategy and considering the realities." Bengal tourism minister Gautam Deb on Sunday accused the Centre of not taking an initiative to conserve the Darjeeling Himalayan Railway and instead supporting Bimal Gurung whose supporters had allegedly vandalised the Unesco heritage property. Rebel Gorkha Janmukti Morcha leader Anit Thapa on Sunday indulged in plainspeak and candour by saying it was the Bengal government that had put him and Binay Tamang at the centre of politics in Darjeeling.